At one point, springing for a camera that could survive a smash or two meant sacrificing, you know, actually getting a decent camera. Not so anymore! Panasonic's 12.1MP TS3 is thoroughly rugged and does geotagging and 1080p video. First, the basics. You can beat this thing up. It's waterproof to 40 feet; shockproof to about 6 feet; freezeproof to -10 degrees C, and dustproof for good measure. Good. And as you'd expect, there are plenty of upgrades over its predecessor, the already-pretty-great TS2, in terms of guts: the TS3 shoots full 1080p HD video; has built-in GPS for geotagging magics where the ZS2 had none; and has a fake 3D mode whihc will snap 20 shots, pick the best two, and overlay them to produce as best a 3D image as it can muster. Not quite the real deal, but you've gotta start somewhere in this crazy new 3D world, right? The TS3's got 4.6x optical zoom, a built-in LED for lighting up dark creepy crawlies and a full suite of Panny's intelligent auto options. It'll be available in March for a to-be-determined price. SECAUCUS, NJ (January 25, 2011) – Panasonic today introduces the LUMIX DMC-TS3, specifically designed for active users who want to capture high-quality photos and 1920 x 1080 full-High Definition videos, incorporating a powerful rugged design and new outdoor-friendly features, such as a built-in GPS function, a compass, altimeter and barometer. The new 12.1-megapixel LUMIX TS3 further strengthens its toughness, when compared to its LUMIX TS2 predecessor, and is now waterproof to approximately 40 feet (12m)*1; shockproof to approximately 6.6 feet (2m) *2; freezeproof to 14ºF (-10 degrees C); and dustproof*1. The Panasonic LUMIX TS3 also features the new Panasonic 3D Photo mode, which produces a realistic 3D photo by taking 20 consecutive photos and overlays the two best to create a 3D image that can then be played on a Panasonic VIERA 3D HDTV. The format of 3D images is compatible with MPO, and can also be played back on other MPO-compatible equipment such as a televisions, digital photo frames and printers. Panasonic also adds the LUMIX Image Uploader, for seamless and instant sharing via Facebook (for digital photos) or YouTube (for videos). Users can checkmark the photo or video files they want to share, connect it to a PC with the included USB cable or by inserting the SD Memory Card directly into the PC's SD Card slot, and then the uploading automatically launches with an easy-to-follow menu option. 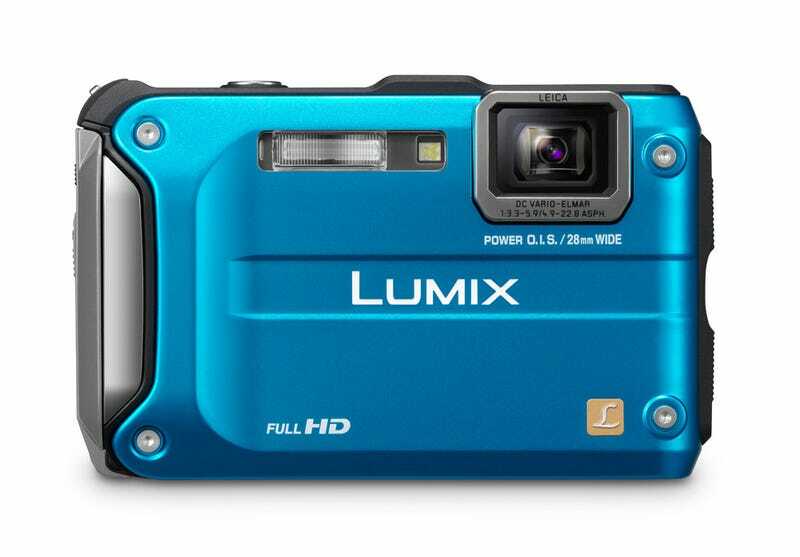 "The LUMIX TS3 is Panasonic's ‘take anywhere' digital camera – whether it is for carefree, everyday shooting with its easy-to-use features, high-quality lens and video capabilities, or for the active user who will appreciate the rugged design in any season – for activities such as hiking, skiing, camping, diving, snorkeling," said David Briganti, Senior Product Manager, Imaging, Panasonic Consumer Electronics Company. "Last year's LUMIX TS2 was a highly-regarded rugged camera and with the TS3, we just built on its success with new features, like GPS, a compass, altimeter and barometer, making this the ultimate camera for the outdoor user." The Panasonic LUMIX TS3 features a 28mm wide-angle LEICA DC VARIO-ELMAR lens, complete with a folded optics design. With an optical zoom up to 4.6x, the LUMIX TS3 works even while shooting video – giving the user the flexibility for a variety of different scenes – especially underwater, where movement is often restricted and the angle of view becomes important for composing shots. Thanks to the newly incorporated Intelligent Resolution technology, the Intelligent Zoom is available and extends the zoom to 6x equivalent. Empowered by a newly developed 12.1-megapixel Hi-Speed CCD sensor, the LUMIX TS3 is compatible with high-speed, large-capacity signal processing required for 1920 x 1080 full-HD AVCHD video recording and high speed continuous shooting. The advanced image processor, the Venus Engine FHD, powers Panasonic's Intelligent Resolution and the Sonic Speed AF, allows for a shutter release time lag as short as approximately 0.005 second. Beyond full-HD video recording capabilities, LUMIX TS3 excels in shooting videos with a Dolby® Digital Creator so audio quality is also high. The built-in LED light greatly supports shooting in dark situations. The LUMIX TS3 also features a 2.7-inch, 230,000-dot Intelligent LCD screen with wide-viewing angle and Anti-Reflection coating. Panasonic's iA Mode, a suite of technologies that engage automatically, has evolved for more powerful image stabilization while video recording and taking still photos with Active Mode which boosts POWER OIS to excel in suppressing blur when recording videos at wide angle while walking. Other features of iA include: POWER OIS, Face Recognition, Face Detection, AF Tracking, Intelligent ISO Control, Intelligent Scene Selector and Intelligent Exposure. With iA, taking beautiful photos is possible for users at any skill level. In addition, the Intelligent Resolution technology is always activated in the iA mode, which helps produce even clearer photos by precisely performing signal processing pixel by pixel to help ensure clear and sharp images. The newly-integrated GPS function, shows the name of the Country/Region, State/Prov./County, County/Township, City/Town/Village and Landmark by using the internal data to give users details on where the photos or videos were taken. The area information covers 203 countries or regions for global users. Plus, more than 1,000,000 landmarks over 78 countries or regions are in the database. Using the included software PHOTOfunSTUDIO 6.1 HD Lite Edition, photos and videos can be searched by location and names. The LUMIX TS3 also features an internal clock that automatically adjusts to the local time when GPS is enabled – a handy feature for travelers. The LUMIX TS3 will be available in March 2011 and pricing will be announced approximately 30 days prior to shipping date. The LUMIX TS3 will be available in red, orange, silver, and blue. For more on these Panasonic LUMIX models, please visit www.panasonic.com/lumix. SECAUCUS, NJ (January 25, 2011) – Panasonic today introduced the LUMIX DMC-ZS10 as the newest member of its acclaimed LUMIX ZS-Series of digital cameras that has won worldwide popularity for its versatile lens from ultra wide-angle to long zoom. The LUMIX ZS10 continues its versatility with a 24mm ultra-wide-angle and powerful 16x optical zoom LEICA DC VARIO-ELMAR lens – and it features full-High Definition 1920x1080 video recording capability, a newly-adopted large 3.0-inch, 460,000-dot Smart Touch Intelligent LCD – which allows for Touch Zoom, Touch Auto Focus (AF), Touch Shutter, and Touch Playback. The LUMIX ZS10 also features a built-in GPS (Global Positioning System) function allowing geotagged images to be pinpointed via online maps and easily shared with friends and families. "With the introduction of the LUMIX ZS10, Panasonic expects to continue to lead the market in long zoom digital cameras, as this very advanced digital camera not only offers a 16x optical zoom, but with an even wider 24mm Leica lens, this is a truly robust digital camera for both still photos and full HD 1080 videos," said David Briganti, Senior Product Manager, Imaging, Panasonic Consumer Electronics Company. "With new features such as touch-screen operation and even a 3D photo mode, Panasonic continues to pack the ZS10 with innovative features for capturing high-quality photos and videos, which can be easily shared with family and friends using the new LUMIX Image Uploader feature." The Panasonic LUMIX ZS10 also features the new Panasonic 3D Photo mode, which produces a realistic 3D photo by taking 20 consecutive photos and overlaying the two best images which provide a 3D image that can then be played on a Panasonic VIERA 3D HDTV. The format of the 3D image is compatible with MPO, and can also be played back on other MPO-compatible equipment such as a televisions, digital photo frame and printers. Panasonic also adds the LUMIX Image Uploader for seamless and instant sharing via Facebook (for digital photos) or YouTube (for videos). Users can checkmark the photo or video files they want to share, connect it to a PC with the included USB cable or by inserting the SD Memory Card directly into the PC's SD Card slot, and then the uploading automatically launches with an easy-to-follow menu option. Using the touch-screen, once locked on the subject, the LUMIX ZS10 tracks the subject with the AF tracking function even if it moves. With the Intelligent Scene Selector in the iA mode, the LUMIX ZS10 automatically switches to the appropriate mode according to the subject touched. For example, a touch on a human face switches to the portrait mode and a touch on the background or a landscape changes to the Scenery mode, while a touch on the subject close in the foreground changes to Macro mode. All menu settings are now available with touch control. The touch-screen operation excels not only for shooting, but also in playback, allowing the user to drag the images across the screen with a finger and browse the collection of photos as though flipping the pages of a book. Newly adopted 14.1-megapixel MOS sensor and the advanced image processor Venus Engine FHD feature high speed, high sensitivity image recording to realize 1920x1080 full-HD movie recording and high speed burst shooting in high picture quality. It also compiles the Intelligent Resolution technology to perform optimum signal processing to give the entire image outstandingly natural clearness with fine details. The powerful 16x optical zoom – available while shooting videos – increases its power to 21x equivalent with the Intelligent Zoom function, taking advantage of Intelligent Resolution technology. The Sonic Speed AF also boasts approximately 49% higher speed compared to its LUMIX ZS7 predecessor. The LUMIX ZS10 shoots 10 fps in 14-megapixel full resolution with mechanical shutter and 5 fps with continuous AF. Even higher speed burst shooting is available with LUMIX ZS10 if the electronic shutter is used - 60 fps in 3.5-megapixel*1. The LUMIX ZS10 is an advanced photographic tool for recording not only great photos but also beautiful full-HD movies. In addition to Motion JPEG images, the LUMIX ZS10 can record high-resolution full-HD 1920x1080 60i videos in AVCHD (MPEG-4 / H.264)* format. The high frame rate of 60i excels in recording moving subjects with outstanding smoothness. The videos also come with the high-quality stereo sound of Dolby® Digital Stereo Creator, to offer highly realistic sound. Panasonic's iA Mode, a suite of technologies that engage automatically, has evolved for more powerful image stabilization while video recording and taking still photos with Active Mode which boosts POWER OIS to excel in suppressing blur when recording videos at wide angle while walking. New iA features include the Intelligent Handheld Nightshot, which creates a beautiful night scenery with illumination by layering the images shot consecutively. Furthermore, the Intelligent Burst Shooting automatically sets the frame rate of burst shooting according to the subject's movement – whether it moves fast or slow – utilizing the mechanism of Intelligent ISO Control. Other features of iA include: Motion Deblur, POWER OIS, Face Recognition, Face Detection, AF Tracking, Intelligent ISO Control, Intelligent Scene Selector and Intelligent Exposure. With iA, taking beautiful photos is possible for users at any skill level. In addition, the Intelligent Resolution technology is always activated in the iA mode, which helps produce even clearer photos by precisely performing signal processing, pixel by pixel, to help ensure clear and sharp images. The LUMIX ZS10 digital camera features a built-in GPS system which tags the location data where the photo was taken with its latitude and longitude automatically in the Exif data. Plus, the LUMIX ZS10 also shows the name of the Country/Region, State/Prov./County, County/Township, City/Town/Village and Landmark by using internal data to give users details on where the photos or videos were taken. The area information covers 203 countries or regions for global users. Plus, more than 1,000,000 landmarks over 78 countries or regions are in the database. Using the included software PHOTOfunSTUDIO 6.1 HD Lite Edition, photos and videos can be searched by location and names. The LUMIX ZS10 also features an internal clock that automatically adjusts to the local time when GPS is enabled – a handy feature for travelers. The LUMIX ZS10 and ZS8 will be available in March 2011 and pricing will be announced approximately 30 days prior to shipping date. The LUMIX ZS10 will be available in black, red, blue, silver, and brown; while the LUMIX ZS8 will be available in black and silver. For more on these Panasonic LUMIX models, please visit www.panasonic.com/lumix.